An isotope powered social stream. 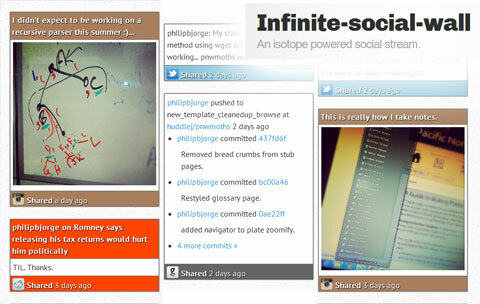 An infinite social stream based on RSS feeds with a MySQL backend. A video demonstrating the functionality (unfortunately not showing the beautiful CSS3 transitions) can be seen on youtube. As well as on my personal homepage philipbjorge.com. Detailed instructions can be found on the wiki. Create a database (or use an existing one). Modify config.php's mysql settings to point to your database. Create and/or chmod the cache folder to be writable by your server (755). Chmod the config file to 640. The file demo.php provides a good minimal example of the requirements. Updated demo.php to include all necessary markup. Added loader to infinite scroll. Trimmed down README and moved to wiki. Refactored PHP code into one file (and config/libs) for ease of distribution. Added HTML5 Shiv for IE support. Hiding new elements and fading them in (with jquery fallback). Dual licensed under the MIT/BSD licenses. Text can be found here. Icons are from icondock which were released under the "Free to use for whatever purposes" license.